Get the complete new text of NFPA 20 -- plus reliable advice for installing stationary fire pumps, standpipe systems, and hose systems -- in one money-saving set. Improve efficiency and performance with two top resources, for less! The 2019 edition NFPA 20, Installation of Stationary Pumps for Fire Protection gives you the latest on ensuring fire pumps are ready for action. Its hands-on companion, the renamed and expanded Stationary Fire Pumps and Standpipe Systems Handbook, is packed with valuable expertise from leading authorities on the interrelationship of NFPA standards, and how to apply provisions correctly the first time. The Handbook compiles mandatory requirements from NFPA 20, NFPA 14, NFPA 24 and more with a vast amount of information and full-color visuals that help you conduct accurate pump, standpipe system, and hose system design, installation, and testing. Help make sure fire pumps, standpipes, and hoses are ready to protect lives and property. Save 15% on the NFPA 20 Stationary Fire Pumps and Standpipe Systems Handbook Set. Advance your knowledge about fire pump technologies and current requirements with the 2016 NFPA 20 and Handbook Set. Save 15%! Revised for new technology and vital clarification for fire pumps arranged in series, the 2016 NFPA 20, Installation of Stationary Pumps for Fire Protection gives you the latest on ensuring fire pumps are ready for action. Its essential companion, NFPA's 2016 Automatic Sprinkler Systems Handbook, is packed with valuable expertise from leading authorities, extra information, and full-color visuals that prepare you to conduct accurate and efficient pump design, installation, and testing. Get both resources together and save! 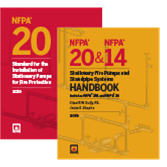 Raise confidence in fire pump performance with the 2016 NFPA 20 and Handbook Set. Help make sure fire pumps can perform on cue. Save 15% on the 2016 NFPA 20 Set.